I am happy to announce that we have published the All Systems Go! 2017 schedule! We are very happy with the large number and the quality of the submissions we got, and the resulting schedule is exceptionally strong. Here's the schedule for the first day (Saturday, 21st of October). And here's the schedule for the second day (Sunday, 22nd of October). Here are a couple of keywords from the topics of the talks: 1password, azure, bluetooth, build systems, casync, cgroups, cilium, cockpit, containers, ebpf, flatpak, habitat, IoT, kubernetes, landlock, meson, OCI, rkt, rust, secureboot, skydive, systemd, testing, tor, varlink, virtualization, wifi, and more. Our speakers are from all across the industry: Chef CoreOS, Covalent, Facebook, Google, Intel, Kinvolk, Microsoft, Mozilla, Pantheon, Pengutronix, Red Hat, SUSE and more. Make sure to buy your ticket for All Systems Go! 2017 now! A limited number of tickets are left at this point, so make sure you get yours before we are all sold out! Find all details here. All Systems Go! 2017 CfP Closes Soon! The All Systems Go! 2017 Call for Participation is Closing on September 3rd! Please make sure to get your presentation proprosals forAll Systems Go! 2017 in now! The CfP closes on sunday! All Systems Go! is an Open Source community conference focused on the projects and technologies at the foundation of modern Linux systems — specifically low-level user-space technologies. Its goal is to provide a friendly and collaborative gathering place for individuals and communities working to push these technologies forward. All Systems Go! 2017 takes place in Berlin, Germany on October 21st+22nd. All Systems Go! is a 2-day event with 2-3 talks happening in parallel. Full presentation slots are 30-45 minutes in length and lightning talk slots are 5-10 minutes. While our focus is definitely more on the user-space side of things, talks about kernel projects are welcome too, as long as they have a clear and direct relevance for user-space. To submit your proposal now please visit our CFP submission web site. systemd.conf will not take place this year in lieu of All Systems Go!. All Systems Go! welcomes all projects that contribute to Linux user space, which, of course, includes systemd. Thus, anything you think was appropriate for submission to systemd.conf is also fitting for All Systems Go! The All Systems Go! 2017 Headline Speakers Announced! Don't forget to send in your submissions to the All Systems Go! 2017 CfP! Proposals are accepted until September 3rd! These folks will also review your submissions as part of the papers committee! All Systems Go! is an Open Source community conference focused on the projects and technologies at the foundation of modern Linux systems — specifically low-level user-space technologies. Its goal is to provide a friendly and collaborative gathering place for individuals and communities working to push these technologies forward. All Systems Go! 2017 takes place in Berlin, Germany on October 21st+22nd. The great folks at kinvolk have uploaded a video of my casync presentation at their offices last week. The slides are available as well. After blogging about casync I realized I never blogged about the mkosi tool that combines nicely with it. mkosi has been around for a while already, and its time to make it a bit better known. mkosi stands for Make Operating System Image, and is a tool for precisely that: generating an OS tree or image that can be booted. Yes, there are many tools like mkosi, and a number of them are quite well known and popular. But mkosi has a number of features that I think make it interesting for a variety of use-cases that other tools don't cover that well. What are those use-cases, and what does mkosi precisely set apart? mkosi is definitely a tool with a focus on developer's needs for building OS images, for testing and debugging, but also for generating production images with cryptographic protection. A typical use-case would be to add a mkosi.default file to an existing project (for example, one written in C or Python), and thus making it easy to generate an OS image for it. mkosi will put together the image with development headers and tools, compile your code in it, run your test suite, then throw away the image again, and build a new one, this time without development headers and tools, and install your build artifacts in it. This final image is then "production-ready", and only contains your built program and the minimal set of packages you configured otherwise. Such an image could then be deployed with casync (or any other tool of course) to be delivered to your set of servers, or IoT devices or whatever you are building. mkosi is supposed to be legacy-free: the focus is clearly on today's technology, not yesteryear's. Specifically this means that we'll generate GPT partition tables, not MBR/DOS ones. When you tell mkosi to generate a bootable image for you, it will make it bootable on EFI, not on legacy BIOS. The GPT images generated follow specifications such as the Discoverable Partitions Specification, so that /etc/fstab can remain unpopulated and tools such as systemd-nspawn can automatically dissect the image and boot from them. Note though that not all distributions are supported at the same feature level currently. Also, as mkosi is based on dnf --installroot, debootstrap, pacstrap and zypper, and those packages are not packaged universally on all distributions, you might not be able to build images for all those distributions on arbitrary host distributions. Without any configuration this will create a GPT disk image for you, will call it image.raw and drop it in the current directory. The distribution used will be the same one as your host runs. mkosi.default — This is the main configuration file, here you can configure what kind of image you want, which distribution, which packages and so on. mkosi.extra/ — If this directory exists, then mkosi will copy everything inside it into the images built. You can place arbitrary directory hierarchies in here, and they'll be copied over whatever is already in the image, after it was put together by the distribution's package manager. This is the best way to drop additional static files into the image, or override distribution-supplied ones. mkosi.build — This executable file is supposed to be a build script. When it exists, mkosi will build two images, one after the other in the mode already mentioned above: the first version is the build image, and may include various build-time dependencies such as a compiler or development headers. The build script is also copied into it, and then run inside it. The script should then build whatever shall be built and place the result in $DESTDIR (don't worry, popular build tools such as Automake or Meson all honor $DESTDIR anyway, so there's not much to do here explicitly). It may also run a test suite, or anything else you like. After the script finished, the build image is removed again, and a second image (the final image) is built. This time, no development packages are included, and the build script is not copied into the image again — however, the build artifacts from the first run (i.e. those placed in $DESTDIR) are copied into the image. mkosi.postinst — If this executable script exists, it is invoked inside the image (inside a systemd-nspawn invocation) and can adjust the image as it likes at a very late point in the image preparation. If mkosi.build exists, i.e. the dual-phased development build process used, then this script will be invoked twice: once inside the build image and once inside the final image. The first parameter passed to the script clarifies which phase it is run in. mkosi.nspawn — If this file exists, it should contain a container configuration file for systemd-nspawn (see systemd.nspawn(5) for details), which shall be shipped along with the final image and shall be included in the check-sum calculations (see below). mkosi.cache/ — If this directory exists, it is used as package cache directory for the builds. This directory is effectively bind mounted into the image at build time, in order to speed up building images. The package installers of the various distributions will place their package files here, so that subsequent runs can reuse them. mkosi.passphrase — If this file exists, it should contain a pass-phrase to use for the LUKS encryption (if that's enabled for the image built). This file should not be readable to other users. mkosi.secure-boot.crt and mkosi.secure-boot.key should be an X.509 key pair to use for signing the kernel and initrd for UEFI SecureBoot, if that's enabled. And there you go: the image should boot up, and just work for you. This is similar as the above, but we made three changes: it's no longer GPT + ext4, but GPT + btrfs. Moreover, the system is made bootable on UEFI systems, and finally, the output is now called foobar.raw. Of course, if you generate the image as plain directory you can't boot it on bare-metal just like that, nor run it in a VM. In this mode we explicitly pick Fedora as the distribution to use, ask mkosi to generate a compressed GPT image with a root squashfs, compress the result with xz, and generate a SHA256SUMS file with the hashes of the generated artifacts. The package will contain the SSH client as well as everybody's favorite editor. Of course, if you run mkosi a couple of times you'll notice that it won't overwrite the generated image when it already exists. You can either delete the file yourself first (rm image.raw) or let mkosi do it for you right before building a new image, with mkosi -f. You can also tell mkosi to not only remove any such pre-existing images, but also remove any cached copies of the incremental feature, by using -f twice. The latter I use only if I want to regenerate everything based on the very newest set of RPMs provided by Fedora, instead of a cached snapshot of it. BTW, the mkosi files for systemd are included in the systemd git tree: mkosi.default and mkosi.build. This way, any developer who wants to quickly test something with current systemd git, or wants to prepare a patch based on it and test it can check out the systemd repository and simply run mkosi in it and a few minutes later he has a bootable image he can test in systemd-nspawn or KVM. casync has similar files: mkosi.default, mkosi.build. As mentioned already, mkosi will generate dm-verity enabled disk images if you ask for it. For that use the --verity switch on the command line or Verity= setting in mkosi.default. Of course, dm-verity implies that the root volume is read-only. In this mode the top-level dm-verity hash will be placed along-side the output disk image in a file named the same way, but with the .roothash suffix. If the image is to be created bootable, the root hash is also included on the kernel command line in the roothash= parameter, which current systemd versions can use to both find and activate the root partition in a dm-verity protected way. BTW: it's a good idea to combine this dm-verity mode with the raw_squashfs image mode, to generate a genuinely protected, compressed image suitable for running in your IoT device. As indicated above, mkosi can automatically create a check-sum file SHA256SUMS for you (--checksum) covering all the files it outputs (which could be the image file itself, a matching .nspawn file using the mkosi.nspawn file mentioned above, as well as the .roothash file for the dm-verity root hash.) It can then optionally sign this with gpg (--sign). Note that systemd's machinectl pull-tar and machinectl pull-raw command can download these files and the SHA256SUMS file automatically and verify things on download. With other words: what mkosi outputs is perfectly ready for downloads using these two systemd commands. As mentioned, mkosi is big on supporting UEFI SecureBoot. To make use of that, place your X.509 key pair in two files mkosi.secureboot.crt and mkosi.secureboot.key, and set SecureBoot= or --secure-boot. If so, mkosi will sign the kernel/initrd/kernel command line combination during the build. Of course, if you use this mode, you should also use Verity=/--verity=, otherwise the setup makes only partial sense. Note that mkosi will not help you with actually enrolling the keys you use in your UEFI BIOS. mkosi has minimal support for GIT checkouts: when it recognizes it is run in a git checkout and you use the mkosi.build script stuff, the source tree will be copied into the build image, but will all files excluded by .gitignore removed. There's support for encryption in place. Use --encrypt= or Encrypt=. Note that the UEFI ESP is never encrypted though, and the root partition only if explicitly requested. The /home and /srv partitions are unconditionally encrypted if that's enabled. Images may be built with all documentation removed. The password for the root user and additional kernel command line arguments may be configured for the image to generate. Current mkosi requires Python 3.5, and has a number of dependencies, listed in the README. Most notably you need a somewhat recent systemd version to make use of its full feature set: systemd 233. Older versions are already packaged for various distributions, but much of what I describe above is only available in the most recent release mkosi 3. The UEFI SecureBoot support requires sbsign which currently isn't available in Fedora, but there's a COPR. One of the biggest goals I have for the future is to teach mkosi and systemd/sd-boot native support for A/B IoT style partition setups. The idea is that the combination of systemd, casync and mkosi provides generic building blocks for building secure, auto-updating devices in a generic way from, even though all pieces may be used individually, too. Why are you reinventing the wheel again? This is exactly like $SOMEOTHERPROJECT! — Well, to my knowledge there's no tool that integrates this nicely with your project's development tree, and can do dm-verity and UEFI SecureBoot and all that stuff for you. So nope, I don't think this exactly like $SOMEOTHERPROJECT, thank you very much. What about creating MBR/DOS partition images? — That's really out of focus to me. This is an exercise in figuring out how generic OSes and devices in the future should be built and an attempt to commoditize OS image building. And no, the future doesn't speak MBR, sorry. That said, I'd be quite interested in adding support for booting on Raspberry Pi, possibly using a hybrid approach, i.e. using a GPT disk label, but arranging things in a way that the Raspberry Pi boot protocol (which is built around DOS partition tables), can still work. Is this portable? — Well, depends what you mean by portable. No, this tool runs on Linux only, and as it uses systemd-nspawn during the build process it doesn't run on non-systemd systems either. But then again, you should be able to create images for any architecture you like with it, but of course if you want the image bootable on bare-metal systems only systems doing UEFI are supported (but systemd-nspawn should still work fine on them). Where can I get this stuff? — Try GitHub. And some distributions carry packaged versions, but I think none of them the current v3 yet. Is this a systemd project? — Yes, it's hosted under the systemd GitHub umbrella. And yes, during run-time systemd-nspawn in a current version is required. But no, the code-bases are separate otherwise, already because systemd is a C project, and mkosi Python. Requiring systemd 233 is a pretty steep requirement, no? — Yes, but the feature we need kind of matters (systemd-nspawn's --overlay= switch), and again, this isn't supposed to be a tool for legacy systems. Can I run the resulting images in LXC or Docker? — Humm, I am not an LXC nor Docker guy. If you select directory or subvolume as image type, LXC should be able to boot the generated images just fine, but I didn't try. Last time I looked, Docker doesn't permit running proper init systems as PID 1 inside the container, as they define their own run-time without intention to emulate a proper system. Hence, no I don't think it will work, at least not with an unpatched Docker version. That said, again, don't ask me questions about Docker, it's not precisely my area of expertise, and quite frankly I am not a fan. To my knowledge neither LXC nor Docker are able to run containers directly off GPT disk images, hence the various raw_xyz image types are definitely not compatible with either. That means if you want to generate a single raw disk image that can be booted unmodified both in a container and on bare-metal, then systemd-nspawn is the container manager to go for (specifically, its -i/--image= switch). Should you care? Is this a tool for you? Well, that's up to you really. If you hack on some embedded or IoT device, then mkosi is a great choice too, as it will make it reasonably easy to generate secure images that are protected against offline modification, by using dm-verity and UEFI SecureBoot. If you are an administrator and need a nice way to build images for a VM or systemd-nspawn container, or a portable service then mkosi is an excellent choice too. If you care about legacy computers, old distributions, non-systemd init systems, old VM managers, Docker, … then no, mkosi is not for you, but there are plenty of well-established alternatives around that cover that nicely. And never forget: mkosi is an Open Source project. We are happy to accept your patches and other contributions. Oh, and one unrelated last thing: don't forget to submit your talk proposal and/or buy a ticket for All Systems Go! 2017 in Berlin — the conference where things like systemd, casync and mkosi are discussed, along with a variety of other Linux userspace projects used for building systems. The All Systems Go! 2017 Call for Participation is Now Open! We’d like to invite presentation proposals for All Systems Go! 2017! All Systems Go! is a 2-day event with 2-3 talks happening in parallel. Full presentation slots are 30-45 minutes in length and lightning talk slots are 5-10 minutes. Please submit your proposals by September 3rd. Notification of acceptance will be sent out 1-2 weeks later. In the past months I have been working on a new project: casync. casync takes inspiration from the popular rsync file synchronization tool as well as the probably even more popular git revision control system. It combines the idea of the rsync algorithm with the idea of git-style content-addressable file systems, and creates a new system for efficiently storing and delivering file system images, optimized for high-frequency update cycles over the Internet. Its current focus is on delivering IoT, container, VM, application, portable service or OS images, but I hope to extend it later in a generic fashion to become useful for backups and home directory synchronization as well (but more about that later). The basic technological building blocks casync is built from are neither new nor particularly innovative (at least not anymore), however the way casync combines them is different from existing tools, and that's what makes it useful for a variety of use-cases that other tools can't cover that well. I created casync after studying how today's popular tools store and deliver file system images. To briefly name a few: Docker has a layered tarball approach, OSTree serves the individual files directly via HTTP and maintains packed deltas to speed up updates, while other systems operate on the block layer and place raw squashfs images (or other archival file systems, such as IS09660) for download on HTTP shares (in the better cases combined with zsync data). Be friendly to Content Delivery Networks (CDNs), i.e. serve neither too many small nor too many overly large files, and only require the most basic form of HTTP. Provide the repository administrator with high-level knobs to tune the average file size delivered. I don't think any of the tools mentioned above are really good on more than a small subset of these points. Specifically: Docker's layered tarball approach dumps the "delta" question onto the feet of the image creators: the best way to make your image downloads minimal is basing your work on an existing image clients might already have, and inherit its resources, maintaining full history. Here, revision control (a tool for the developer) is intermingled with update management (a concept for optimizing production delivery). As container histories grow individual deltas are likely to stay small, but on the other hand a brand-new deployment usually requires downloading the full history onto the deployment system, even though there's no use for it there, and likely requires substantially more disk space and download sizes. OSTree's serving of individual files is unfriendly to CDNs (as many small files in file trees cause an explosion of HTTP GET requests). To counter that OSTree supports placing pre-calculated delta images between selected revisions on the delivery servers, which means a certain amount of revision management, that leaks into the clients. Delivering direct squashfs (or other file system) images is almost beautifully simple, but of course means every update requires a full download of the newest image, which is both bad for disk usage and generated traffic. Enhancing it with zsync makes this a much better option, as it can reduce generated traffic substantially at very little cost of history/meta-data (no explicit deltas between a large number of versions need to be prepared server side). On the other hand server requirements in disk space and functionality (HTTP Range requests) are minus points for the use-case I am interested in. Besides the issues pointed out above I wasn't happy with the security and reproducibility properties of these systems. In today's world where security breaches involving hacking and breaking into connected systems happen every day, an image delivery system that cannot make strong guarantees regarding data integrity is out of date. Specifically, the tarball format is famously nondeterministic: the very same file tree can result in any number of different valid serializations depending on the tool used, its version and the underlying OS and file system. Some tar implementations attempt to correct that by guaranteeing that each file tree maps to exactly one valid serialization, but such a property is always only specific to the tool used. I strongly believe that any good update system must guarantee on every single link of the chain that there's only one valid representation of the data to deliver, that can easily be verified. Encoding: Let's take a large linear data stream, split it into variable-sized chunks (the size of each being a function of the chunk's contents), and store these chunks in individual, compressed files in some directory, each file named after a strong hash value of its contents, so that the hash value may be used to as key for retrieving the full chunk data. Let's call this directory a "chunk store". At the same time, generate a "chunk index" file that lists these chunk hash values plus their respective chunk sizes in a simple linear array. The chunking algorithm is supposed to create variable, but similarly sized chunks from the data stream, and do so in a way that the same data results in the same chunks even if placed at varying offsets. For more information see this blog story. Decoding: Let's take the chunk index file, and reassemble the large linear data stream by concatenating the uncompressed chunks retrieved from the chunk store, keyed by the listed chunk hash values. As an extra twist, we introduce a well-defined, reproducible, random-access serialization format for file trees (think: a more modern tar), to permit efficient, stable storage of complete file trees in the system, simply by serializing them and then passing them into the encoding step explained above. Finally, let's put all this on the network: for each image you want to deliver, generate a chunk index file and place it on an HTTP server. Do the same with the chunk store, and share it between the various index files you intend to deliver. Why bother with all of this? Streams with similar contents will result in mostly the same chunk files in the chunk store. This means it is very efficient to store many related versions of a data stream in the same chunk store, thus minimizing disk usage. Moreover, when transferring linear data streams chunks already known on the receiving side can be made use of, thus minimizing network traffic. Why is this different from rsync or OSTree, or similar tools? Well, one major difference between casync and those tools is that we remove file boundaries before chunking things up. This means that small files are lumped together with their siblings and large files are chopped into pieces, which permits us to recognize similarities in files and directories beyond file boundaries, and makes sure our chunk sizes are pretty evenly distributed, without the file boundaries affecting them. The "chunking" algorithm is based on a the buzhash rolling hash function. SHA256 is used as strong hash function to generate digests of the chunks. xz is used to compress the individual chunks. You may use it on the block layer. In this case the raw block data on disk is taken as-is, read directly from the block device, split into chunks as described above, compressed, stored and delivered. You may use it on the file system layer. In this case, the file tree serialization format mentioned above comes into play: the file tree is serialized depth-first (much like tar would do it) and then split into chunks, compressed, stored and delivered. The fact that it may be used on both the block and file system layer opens it up for a variety of different use-cases. In the VM and IoT ecosystems shipping images as block-level serializations is more common, while in the container and application world file-system-level serializations are more typically used. Chunk index files referring to block-layer serializations carry the .caibx suffix, while chunk index files referring to file system serializations carry the .caidx suffix. Note that you may also use casync as direct tar replacement, i.e. 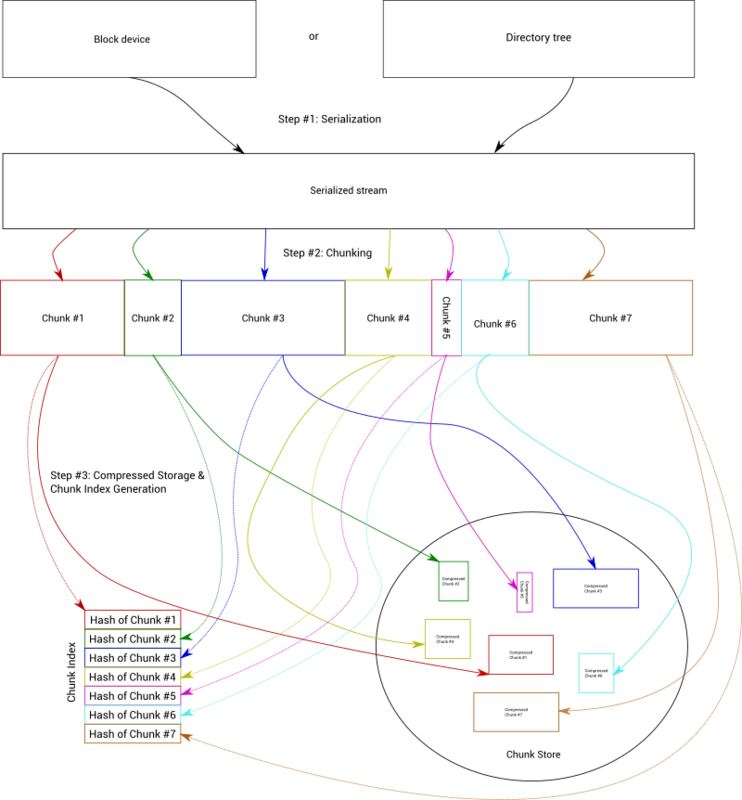 without the chunking, just generating the plain linear file tree serialization. Such files carry the .catar suffix. Internally .caibx are identical to .caidx files, the only difference is semantical: .caidx files describe a .catar file, while .caibx files may describe any other blob. Finally, chunk stores are directories carrying the .castr suffix. When downloading a new image you may use casync's --seed= feature: each block device, file, or directory specified is processed using the same chunking logic described above, and is used as preferred source when putting together the downloaded image locally, avoiding network transfer of it. This of course is useful whenever updating an image: simply specify one or more old versions as seed and only download the chunks that truly changed since then. Note that using seeds requires no history relationship between seed and the new image to download. This has major benefits: you can even use it to speed up downloads of relatively foreign and unrelated data. For example, when downloading a container image built using Ubuntu you can use your Fedora host OS tree in /usr as seed, and casync will automatically use whatever it can from that tree, for example timezone and locale data that tends to be identical between distributions. Example: casync extract http://example.com/myimage.caibx --seed=/dev/sda1 /dev/sda2. This will place the block-layer image described by the indicated URL in the /dev/sda2 partition, using the existing /dev/sda1 data as seeding source. An invocation like this could be typically used by IoT systems with an A/B partition setup. Example 2: casync extract http://example.com/mycontainer-v3.caidx --seed=/srv/container-v1 --seed=/srv/container-v2 /src/container-v3, is very similar but operates on the file system layer, and uses two old container versions to seed the new version. When operating on the file system level, the user has fine-grained control on the meta-data included in the serialization. This is relevant since different use-cases tend to require a different set of saved/restored meta-data. For example, when shipping OS images, file access bits/ACLs and ownership matter, while file modification times hurt. When doing personal backups OTOH file ownership matters little but file modification times are important. Moreover different backing file systems support different feature sets, and storing more information than necessary might make it impossible to validate a tree against an image if the meta-data cannot be replayed in full. Due to this, casync provides a set of --with= and --without= parameters that allow fine-grained control of the data stored in the file tree serialization, including the granularity of modification times and more. The precise set of selected meta-data features is also always part of the serialization, so that seeding can work correctly and automatically. casync tries to be as accurate as possible when storing file system meta-data. This means that besides the usual baseline of file meta-data (file ownership and access bits), and more advanced features (extended attributes, ACLs, file capabilities) a number of more exotic data is stored as well, including Linux chattr(1) file attributes, as well as FAT file attributes (you may wonder why the latter? — EFI is FAT, and /efi is part of the comprehensive serialization of any host). In the future I intend to extend this further, for example storing btrfs sub-volume information where available. Note that as described above every single type of meta-data may be turned off and on individually, hence if you don't need FAT file bits (and I figure it's pretty likely you don't), then they won't be stored. The user creating .caidx or .caibx files may control the desired average chunk length (before compression) freely, using the --chunk-size= parameter. Smaller chunks increase the number of generated files in the chunk store and increase HTTP GET load on the server, but also ensure that sharing between similar images is improved, as identical patterns in the images stored are more likely to be recognized. By default casync will use a 64K average chunk size. Tweaking this can be particularly useful when adapting the system to specific CDNs, or when delivering compressed disk images such as squashfs (see below). Emphasis is placed on making all invocations reproducible, well-defined and strictly deterministic. As mentioned above this is a requirement to reach the intended security guarantees, but is also useful for many other use-cases. For example, the casync digest command may be used to calculate a hash value identifying a specific directory in all desired detail (use --with= and --without to pick the desired detail). Moreover the casync mtree command may be used to generate a BSD mtree(5) compatible manifest of a directory tree, .caidx or .catar file. The file system serialization format is nicely composable. By this I mean that the serialization of a file tree is the concatenation of the serializations of all files and file sub-trees located at the top of the tree, with zero meta-data references from any of these serializations into the others. This property is essential to ensure maximum reuse of chunks when similar trees are serialized. When extracting file trees or disk image files, casync will automatically create reflinks from any specified seeds if the underlying file system supports it (such as btrfs, ocfs, and future xfs). After all, instead of copying the desired data from the seed, we can just tell the file system to link up the relevant blocks. This works both when extracting .caidx and .caibx files — the latter of course only when the extracted disk image is placed in a regular raw image file on disk, rather than directly on a plain block device, as plain block devices do not know the concept of reflinks. Optionally, when extracting file trees, casync can create traditional UNIX hard-links for identical files in specified seeds (--hardlink=yes). This works on all UNIX file systems, and can save substantial amounts of disk space. However, this only works for very specific use-cases where disk images are considered read-only after extraction, as any changes made to one tree will propagate to all other trees sharing the same hard-linked files, as that's the nature of hard-links. In this mode, casync exposes OSTree-like behavior, which is built heavily around read-only hard-link trees. casync tries to be smart when choosing what to include in file system images. Implicitly, file systems such as procfs and sysfs are excluded from serialization, as they expose API objects, not real files. Moreover, the "nodump" (+d) chattr(1) flag is honored by default, permitting users to mark files to exclude from serialization. When creating and extracting file trees casync may apply an automatic or explicit UID/GID shift. This is particularly useful when transferring container image for use with Linux user name-spacing. In addition to local operation, casync currently supports HTTP, HTTPS, FTP and ssh natively for downloading chunk index files and chunks (the ssh mode requires installing casync on the remote host, though, but an sftp mode not requiring that should be easy to add). When creating index files or chunks, only ssh is supported as remote back-end. When operating on block-layer images, you may expose locally or remotely stored images as local block devices. Example: casync mkdev http://example.com/myimage.caibx exposes the disk image described by the indicated URL as local block device in /dev, which you then may use the usual block device tools on, such as mount or fdisk (only read-only though). Chunks are downloaded on access with high priority, and at low priority when idle in the background. Note that in this mode, casync also plays a role similar to "dm-verity", as all blocks are validated against the strong digests in the chunk index file before passing them on to the kernel's block layer. This feature is implemented though Linux' NBD kernel facility. Similar, when operating on file-system-layer images, you may mount locally or remotely stored images as regular file systems. Example: casync mount http://example.com/mytree.caidx /srv/mytree mounts the file tree image described by the indicated URL as a local directory /srv/mytree. This feature is implemented though Linux' FUSE kernel facility. Note that special care is taken that the images exposed this way can be packed up again with casync make and are guaranteed to return the bit-by-bit exact same serialization again that it was mounted from. No data is lost or changed while passing things through FUSE (OK, strictly speaking this is a lie, we do lose ACLs, but that's hopefully just a temporary gap to be fixed soon). In IoT A/B fixed size partition setups the file systems placed in the two partitions are usually much shorter than the partition size, in order to keep some room for later, larger updates. casync is able to analyze the super-block of a number of common file systems in order to determine the actual size of a file system stored on a block device, so that writing a file system to such a partition and reading it back again will result in reproducible data. Moreover this speeds up the seeding process, as there's little point in seeding the white-space after the file system within the partition. This will use ssh to connect to the ssh.example.com server, and then places the .caidx file and the chunks on it. Note that this mode of operation is "smart": this scheme will only upload chunks currently missing on the server side, and not re-transmit what already is available. Note that you can always configure the precise path or URL of the chunk store via the --store= option. If you do not do that, then the store path is automatically derived from the path or URL: the last component of the path or URL is replaced by default.castr. This command will create a chunk index for a file tree serialization that has three features above the absolute baseline supported: 1s granularity time-stamps, symbolic links and a single read-only bit. In this mode, all the other meta-data bits are not stored, including nanosecond time-stamps, full UNIX permission bits, file ownership or even ACLs or extended attributes. This will create a block device in /dev and print the used device node path to STDOUT. $ casync digest --with=unix . This makes use of the --with=unix shortcut for selecting meta-data fields. Specifying --with-unix= selects all meta-data that traditional UNIX file systems support. It is a shortcut for writing out: --with=16bit-uids --with=permissions --with=sec-time --with=symlinks --with=device-nodes --with=fifos --with=sockets. This generates a digest with the most accurate meta-data, but leaves one feature out: chattr(1)'s immutable (+i) file flag. The former command will generate a brief list of files and directories, not too different from tar t or ls -al in its output. The latter command will generate a BSD mtree(5) compatible manifest. Note that casync actually stores substantially more file meta-data than mtree files can express, though. casync is not an attempt to minimize serialization and downloaded deltas to the extreme. Instead, the tool is supposed to find a good middle ground, that is good on traffic and disk space, but not at the price of convenience or requiring explicit revision control. If you care about updates that are absolutely minimal, there are binary delta systems around that might be an option for you, such as Google's Courgette. casync is not a replacement for rsync, or git or zsync or anything like that. They have very different use-cases and semantics. For example, rsync permits you to directly synchronize two file trees remotely. casync just cannot do that, and it is unlikely it every will. To make the tool useful for backups, encryption is missing. I have pretty concrete plans how to add that. When implemented, the tool might become an alternative to restic, BorgBackup or tarsnap. Right now, if you want to deploy casync in real-life, you still need to validate the downloaded .caidx or .caibx file yourself, for example with some gpg signature. It is my intention to integrate with gpg in a minimal way so that signing and verifying chunk index files is done automatically. In the longer run, I'd like to build an automatic synchronizer for $HOME between systems from this. Each $HOME instance would be stored automatically in regular intervals in the cloud using casync, and conflicts would be resolved locally. casync is written in a shared library style, but it is not yet built as one. Specifically this means that almost all of casync's functionality is supposed to be available as C API soon, and applications can process casync files on every level. It is my intention to make this library useful enough so that it will be easy to write a module for GNOME's gvfs subsystem in order to make remote or local .caidx files directly available to applications (as an alternative to casync mount). In fact the idea is to make this all flexible enough that even the remoting back-ends can be replaced easily, for example to replace casync's default HTTP/HTTPS back-ends built on CURL with GNOME's own HTTP implementation, in order to share cookies, certificates, … There's also an alternative method to integrate with casync in place already: simply invoke casync as a sub-process. casync will inform you about a certain set of state changes using a mechanism compatible with sd_notify(3). In future it will also propagate progress data this way and more. I intend to a add a new seeding back-end that sources chunks from the local network. After downloading the new .caidx file off the Internet casync would then search for the listed chunks on the local network first before retrieving them from the Internet. This should speed things up on all installations that have multiple similar systems deployed in the same network. Further plans are listed tersely in the TODO file. Is this a systemd project? — casync is hosted under the github systemd umbrella, and the projects share the same coding style. However, the code-bases are distinct and without interdependencies, and casync works fine both on systemd systems and systems without it. Is casync portable? — At the moment: no. I only run Linux and that's what I code for. That said, I am open to accepting portability patches (unlike for systemd, which doesn't really make sense on non-Linux systems), as long as they don't interfere too much with the way casync works. Specifically this means that I am not too enthusiastic about merging portability patches for OSes lacking the openat(2) family of APIs. Does casync require reflink-capable file systems to work, such as btrfs? — No it doesn't. The reflink magic in casync is employed when the file system permits it, and it's good to have it, but it's not a requirement, and casync will implicitly fall back to copying when it isn't available. Note that casync supports a number of file system features on a variety of file systems that aren't available everywhere, for example FAT's system/hidden file flags or xfs's projinherit file flag. Is casync stable? — I just tagged the first, initial release. While I have been working on it since quite some time and it is quite featureful, this is the first time I advertise it publicly, and it hence received very little testing outside of its own test suite. I am also not fully ready to commit to the stability of the current serialization or chunk index format. I don't see any breakages coming for it though. casync is pretty light on documentation right now, and does not even have a man page. I also intend to correct that soon. Are the .caidx/.caibx and .catar file formats open and documented? — casync is Open Source, so if you want to know the precise format, have a look at the sources for now. It's definitely my intention to add comprehensive docs for both formats however. Don't forget this is just the initial version right now. casync is just like $SOMEOTHERTOOL! Why are you reinventing the wheel (again)? — Well, because casync isn't "just like" some other tool. I am pretty sure I did my homework, and that there is no tool just like casync right now. The tools coming closest are probably rsync, zsync, tarsnap, restic, but they are quite different beasts each. Why did you invent your own serialization format for file trees? Why don't you just use tar? — That's a good question, and other systems — most prominently tarsnap — do that. However, as mentioned above tar doesn't enforce reproducibility. It also doesn't really do random access: if you want to access some specific file you need to read every single byte stored before it in the tar archive to find it, which is of course very expensive. The serialization casync implements places a focus on reproducibility, random access, and meta-data control. Much like traditional tar it can still be generated and extracted in a stream fashion though. Does casync save/restore SELinux/SMACK file labels? — At the moment not. That's not because I wouldn't want it to, but simply because I am not a guru of either of these systems, and didn't want to implement something I do not fully grok nor can test. If you look at the sources you'll find that there's already some definitions in place that keep room for them though. I'd be delighted to accept a patch implementing this fully. What about delivering squashfs images? How well does chunking work on compressed serializations? – That's a very good point! Usually, if you apply the a chunking algorithm to a compressed data stream (let's say a tar.gz file), then changing a single bit at the front will propagate into the entire remainder of the file, so that minimal changes will explode into major changes. Thankfully this doesn't apply that strictly to squashfs images, as it provides random access to files and directories and thus breaks up the compression streams in regular intervals to make seeking easy. This fact is beneficial for systems employing chunking, such as casync as this means single bit changes might affect their vicinity but will not explode in an unbounded fashion. In order achieve best results when delivering squashfs images through casync the block sizes of squashfs and the chunks sizes of casync should be matched up (using casync's --chunk-size= option). How precisely to choose both values is left a research subject for the user, for now. What does the name casync mean? – It's a synchronizing tool, hence the -sync suffix, following rsync's naming. It makes use of the content-addressable concept of git hence the ca- prefix. Where can I get this stuff? Is it already packaged? – Check out the sources on GitHub. I just tagged the first version. Martin Pitt has packaged casync for Ubuntu. There is also an ArchLinux package. Zbigniew Jędrzejewski-Szmek has prepared a Fedora RPM that hopefully will soon be included in the distribution. Well, that's up to you really. If you are involved with projects that need to deliver IoT, VM, container, application or OS images, then maybe this is a great tool for you — but other options exist, some of which are linked above. Note that casync is an Open Source project: if it doesn't do exactly what you need, prepare a patch that adds what you need, and we'll consider it. If you are interested in the project and would like to talk about this in person, I'll be presenting casync soon at Kinvolk's Linux Technologies Meetup in Berlin, Germany. You are invited. I also intend to talk about it at All Systems Go!, also in Berlin. Just a quick note: on recent versions of systemd it is relatively easy to block the vulnerability described in CVE-2016-8655 for individual services. This restricts access to socket families, so that the service may access only AF_INET, AF_INET6 or AF_UNIX sockets, which is usually the right, minimal set for most system daemons. (AF_INET is the low-level name for the IPv4 address family, AF_INET6 for the IPv6 address family, and AF_UNIX for local UNIX socket IPC). Starting with systemd v232 we added RestrictAddressFamilies= to all of systemd's own unit files, always with the minimal set of socket address families appropriate. With the upcoming v233 release we'll provide a second method for blocking this vulnerability. Using RestrictNamespaces= it is possible to limit which types of Linux namespaces a service may get access to. Use RestrictNamespaces=yes to prohibit access to any kind of namespace, or set RestrictNamespaces=net ipc (or similar) to restrict access to a specific set (in this case: network and IPC namespaces). Given that user namespaces have been a major source of security vulnerabilities in the past months it's probably a good idea to block namespaces on all services which don't need them (which is probably most of them). Of course, ideally, distributions such as Fedora, as well as upstream developers would turn on the various sandboxing settings systemd provides like these ones by default, since they know best which kind of address families or namespaces a specific daemon needs. systemd.conf 2016 is Over Now! A few days ago systemd.conf 2016 ended, our second conference of this kind. I personally enjoyed this conference a lot: the talks, the atmosphere, the audience, the organization, the location, they all were excellent! I'd like to take the opportunity to thanks everybody involved. In particular I'd like to thank Chris, Daniel, Sandra and Henrike for organizing the conference, your work was stellar! I'd also like to thank our sponsors, without which the conference couldn't take place like this, of course. In particular I'd like to thank our gold sponsor, Red Hat, our organizing sponsor Kinvolk, as well as our silver sponsors CoreOS and Facebook. I'd also like to thank our bronze sponsors Collabora, OpenSUSE, Pantheon, Pengutronix, our supporting sponsor Codethink and last but not least our media sponsor Linux Magazin. Thank you all! I'd also like to thank the Video Operation Center ("VOC") for their amazing work on live-streaming the conference and making all talks available on YouTube. It's amazing how efficient the VOC is, it's simply stunning! Thank you guys! In case you missed this year's iteration of the conference, please have a look at our YouTube Channel. You'll find all of this year's talks there, as well the ones from last year. (For example, my welcome talk is available here). Enjoy! We hope to see you again next year, for systemd.conf 2017 in Berlin! Tickets for systemd 2016 Workshop day still available! We still have a number of ticket for the workshop day of systemd.conf 2016 available. If you are a newcomer to systemd, and would like to learn about various systemd facilities, or if you already know your way around, but would like to know more: this is the best chance to do so. The workshop day is the 28th of September, one day before the main conference, at the betahaus in Berlin, Germany. The schedule for the day is available here. There are five interesting, extensive sessions, run by the systemd hackers themselves. Who better to learn systemd from, than the folks who wrote it? Note that the workshop day and the main conference days require different tickets. (Also note: there are still a few tickets available for the main conference! ).